The Sound of Music was nominated for 10 Academy Awards in 1966, winning 5 of them. Best Picture, Best Director, Best Sound, Best Editing, Best Music, Best Actress, Best Supporting Actress, Best Cinematography, Best Art Direction, Best Set Design; that’s a lot of Bests. It was the greatest film of the year, one of the greatest films of the decade, and arguably is still among the top movies of all-time. What makes it so special? Better ask what doesn’t, since you’ll be hard-pressed to find its flaws. It’s length (3 hours) might be its biggest deterrent, but with an added intermission time flies, and the story varies enough as to never get boring. Oh yes, and then there’s the music, a soundtrack that has defined lives. This film is an icon, and appropriately so. When young Maria feels unsure, she races into the Austrian countryside, those hills surrounding Salzburg being a home away from home. Actually, Maria herself is away from home, attempting to devote her life to God in the city’s abbey. But becoming a nun might not be the calling that God has placed upon Maria, exemplified in the fact that she can’t follow a single rule. And so the Reverend Mother sends this impetuous girl out into the world to see where her path might lead her. A local family, the Von Trapps, are in need of a governess. The wealthy Captain has lost his wife, and his seven children need guidance. Not only will Maria provide that, but she’ll fall in love; with the Captain, with the children, with music, and with a new purpose in life that she never saw approaching. 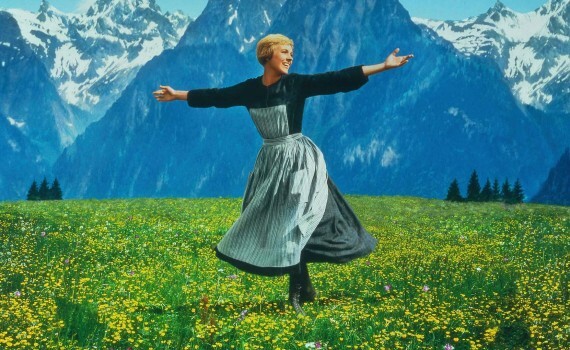 A classic among classics, The Sound of Music still holds its title as the most memorable movie ever produced. Just think about it; every one of us knows countless songs from this film, or perhaps from the play, the two twining together perfectly. You’ve hummed a tune from this film to yourself before and you will again: Sixteen Going on Seventeen, Favorite Things, Do-Re-Mi, Climb Ev’ry Mountain, Edelweiss, this last often believed to actually be the national anthem of Austria, which of course it is not. It is, though, the very last song Rodgers & Hammerstein wrote together, a perfect ending to that pair’s success. And that’s just the music, what about the beautiful mountains, the Nazi takeover, the love story, the children; I could go on & on. Andrews is perfect here as Maria, Plummer a faultless companion, and every actor works together within the confines of the play to create something truly magical, a film that will live forever, something that once seen can never be forgotten.